Parking – How should developers plan for a future of decreasing parking demand? How will existing structures be repurposed? How will street-side parking be affected? Neighborhood Impacts – How could driverless cars change where people choose to live and work? Will autonomous vehicles extend commutes and increase demand for neighborhoods outside the urban core? What happens to transit-oriented developments (TOD)? Will we see winning and losing locations? Regulation – How are city planners responding to this new technology and its impacts? 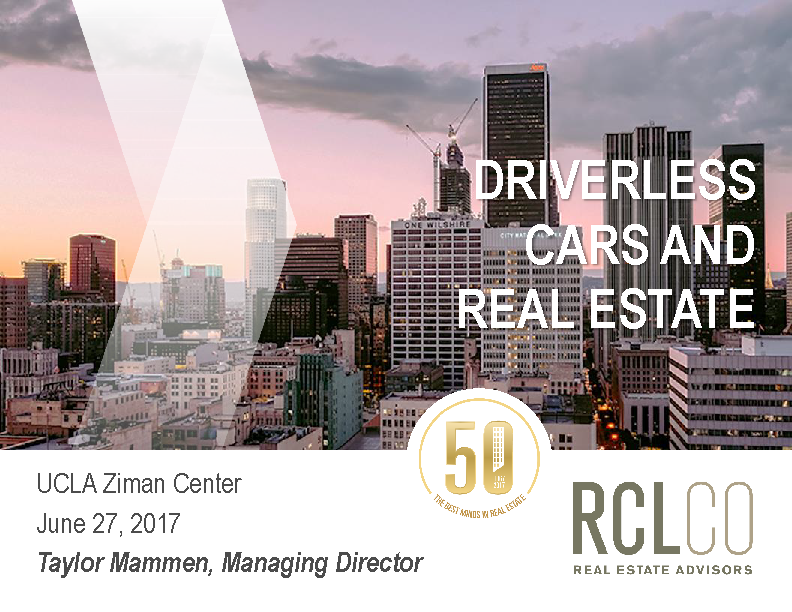 How could driverless cars lead to changes to building codes or land use regulations? Online Retail/Industrial – Autonomous trucks running 24/7 have the potential to disrupt logistics, warehousing and distribution of physical goods. How will retail and industrial buildings be affected? Ridesharing – Uber and Lyft are already changing ownership patterns. Will driverless cars push car ownership into a thing of the past?